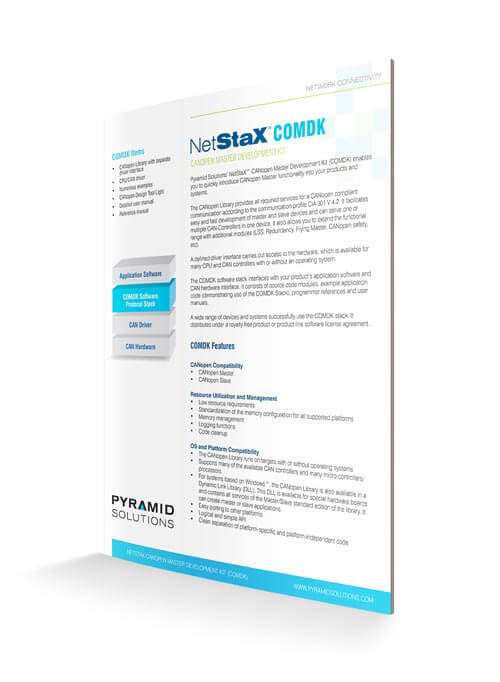 Pyramid Solutions’ NetStaX™ CANopen Master Development Kit (COMDK) enables you to quickly introduce CANopen Master functionality into your products and systems. 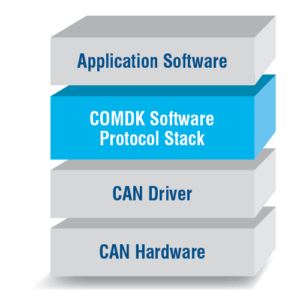 The COMDK CANopen Master Software Protocol Stack provides all required services for CANopen compliant communications, according to the communication profile CiA 301 V 4.2. It facilitates simplified and rapid development of master and slave devices and is able to serve one or multiple CAN-Controllers in one device. Additional modules (LSS, Redundancy, Flying Master, CANopen safety, etc.) extend its functionality. A defined driver interface carries out access to the hardware, which is available for many CPU and CAN controllers with and without an operating system. The COMDK interfaces with your product’s application software and CAN hardware interface. It consists of source code modules, example application code (demonstrating use of the COMDK Stack), and Programmer Reference and User manuals.